I’m usually not too big on ghost and goblins, but these little guys were to cute to pass up, so I took a few liberties with the circle element of Taylor’s Sketch today. 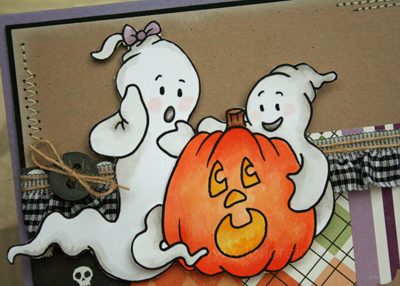 I colored and cut my ghosts and pumpkin. Aren’t these OCL images adorable? 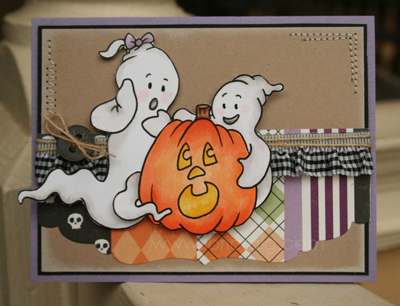 I’ve paired the images with <surprise> Echo Park Halloween paper. I am committing to you that I will *not* use Echo Park on my next blog project. Brownie Scouts honor! My Copic Marker colors for the pumpkin are: YR12, YR16 and a bit of YR04. The mouth, eyes and nose: Y15 and Y19. Gray scale on the ghosts: W0, W1 and W2. I cut the bottom edge of my paper tags with the new MFT Perfect Bracket Die. 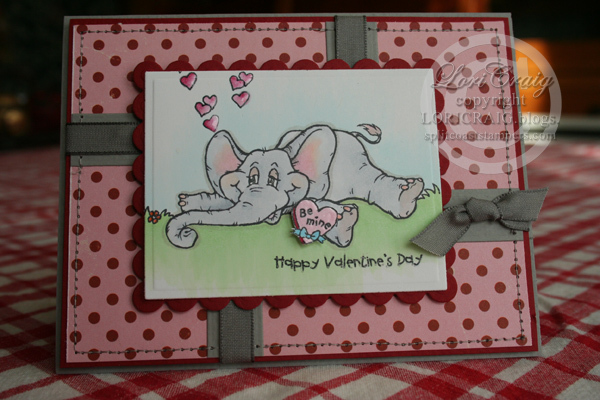 <swoon> It’s sized large enough to put a pretty edge across a whole card front. LOVE! How I did it: I cut my patterned paper squares to go across the front of my card and adhered them to a strip of scrap paper at the top on the backside just to keep them all lined up nice and neat. Then, I trimmed the bottom edge with the die across the bottom. Easy-peasy. This die will be a mainstay on my craft table, and I cannot promise you that it won’t be used on my next card – even if I move on to a new paper line. It’s Homecoming weekend here in Midwest America! Go OWLS! 🙂 We’ll be doing the parade and game thing today and tonight. And, then this weekend, I’m super excited to go shopping with my mom. I hardly *ever* get to do that. Yeah me! Have a wonderful weekend, and thanks for stopping by! I need 2 birthday cards for my nephews, and I thought that this little Kona image from Hangin’ Loose by Our Craft Lounge would be perfect. 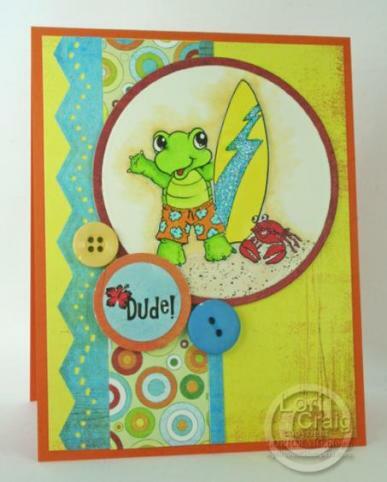 Boy cards need bright colors, IMO, so I used LimeRickey paper from Basic Grey and Copic Markers. Too fun! I’m not good at getting cards out on time, but hopefully, these will bring a smile when they arrive at their destination. It feels good to be back in a routine with my Girl Friday friends. 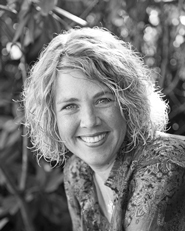 Beate has posted a Friday Sketch, and Cambria Turnbow, Charmaine Ikach, Laurie Schmidlin, Jenn Balcer, Mary Jo Albright and Sharon Harnist have plenty of sample inspiration to go along with it. Hope you can carve out some time for stamping today. It does the heart good, you know!? 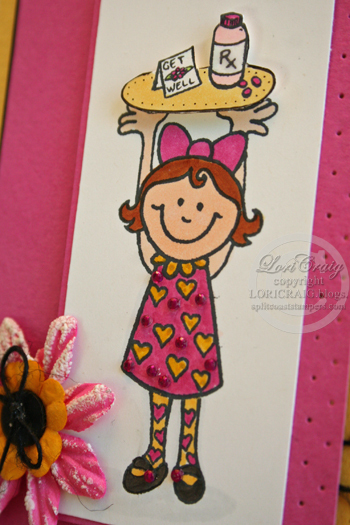 I used a new set from Our Craft Lounge, Ducky Days, for my card today. 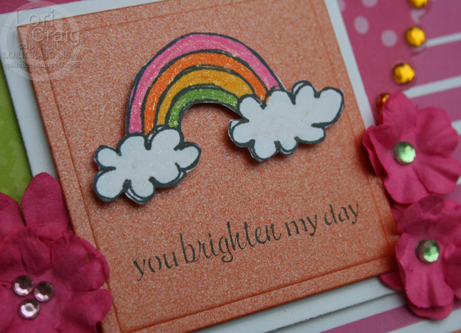 I loved this little rainbow image, and I had only one person in mind when I picked out these papers! CherryArte is the line of these pink, orange and green papers. The main image is stamped with Black Tuxedo Memento Ink from Tsukineko and colored with Copics and Spica Glitter Pen. Next I trimmed it out and matted on Stardream Metallic Cardstock – This one is called Flame. 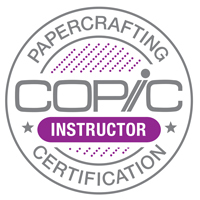 I get mine from the super sweet folks at cutcardstock.com. The sentiment is from one of my favorite sentiment sets that I got from Taylor. It’s called A Year of Sweet Sentiments. The long layout card isn’t something I do too often. Since I prefer to make cards that open from the top (they stand for display better is the only reason) I rotated the sketch. The bling and the paper flowers are from KaiserCraft. I’m glad you stopped by today. We’re expecting company this weekend, and I’ve got a long list of things to take care of today. 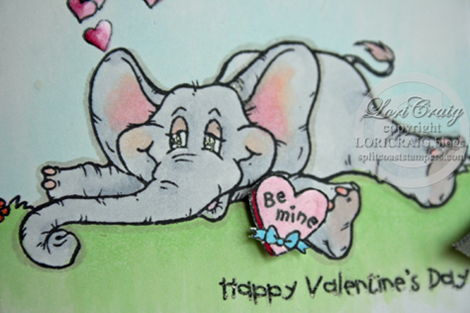 Hope you have a wonderful Valentine’s Weekend! Thanks for stopping by! 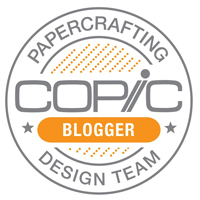 Feel Better Soon – want a Copic Give Away? Ah – this little cutie, AnnaMae set from Our Craft Lounge – I had to order this set. AnnaMae reminds me so much of my youngest little DD. I’ve colored her hair ‘brownish-reddish’ and given her sassy colored tights to match her dress. That is just how my little one would be…grinning from ear to ear and no attention to hot pink and yellow clashing with ‘brownish-reddish’ hair. The set is designed for celebrations and birthdays and comes with a darling little cake on a platter image for AnnaMae to hold, but by free-handing a little platter for her with a Copic Multiliner (part of my give away – scroll down) and stamping the RX image from the Dr. Peanut set, I was able to make it into a ‘get-well’ image. The Multiliners work wonders for filling in a missed-stamped image every once in a while, too. The images are colored with Copic Makers on GinaK Pure Luxury cardstock and then layered with Candleglow Medium and Azalea Medium from Prism. Accented with black bling and some Prima flowers, this should cheer up a sickly soul, especially if smiley-girl would deliver it in person. Pink rhinestones are from Taylored Expressions. Look Ma! No coloring! 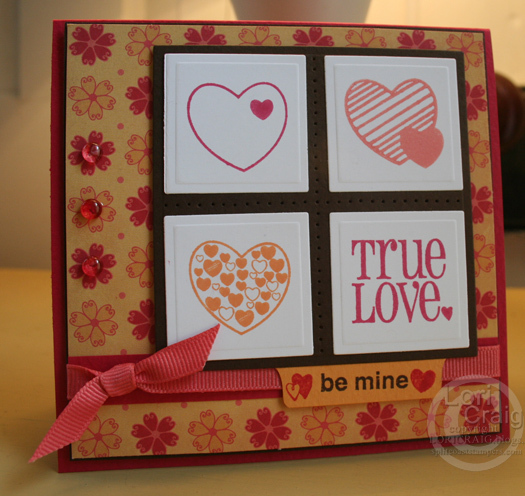 I was drawn to these new sets (So in Love & True Love) from Our Craft Lounge because there is no coloring required. After all the holiday bustle, I was ready to enjoy some simple stamping. 🙂 I paired the Forget-Me-Not Cosmo Cricket Paper from the Chemistry line with Papaya Puree Medium, Rose Red Medium and Suede Dark Brown Prism. 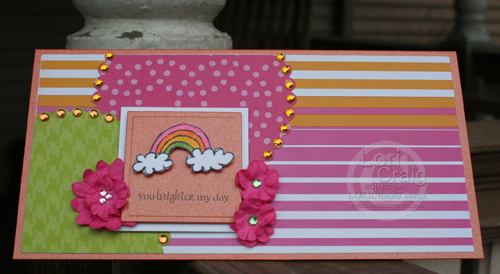 Cosmo Cricket coordinates beautifully with Prism Papers. Inks are Watermelon, Orange and Mountain Rose Adirondack Dye. Some paper piercing and dew drops to accent the images. I’m off to watch the rest of the Cotton Bowl. Can Graham Harrell make it happen today for the Texas Tech Red Raiders? Guns UP! …to Valentine’s…just for the day. I needed a little break from tags and bags. I love it when I find time to do the SCS Sketch Challenge. I’m fixin’ supper for 140 at church tonight. I work with a fabulous team of girls every 3rd Wednesday of the month to get that done. We have a great time gabbing and catching up. On the menu: lasagna, greek salad, green beans with bacon, french bread and strawberry shortcake…how many WW points is that? Don’t tell me, I don’t want to know! Have a great day! I’ll see you tomorrow!